You'll find the absolute best permanent dumpsters here for your business. We offer an entire suite of sizes so you can pick which dumpster is right for your needs. The smallest option is the 2-yarder, great for small businesses without a lot of trash flow. The largest option is the 8-yarder; great for warehouses and those who have a lot of debris to manage on a weekly basis. If you're not sure what is right for you, we will work with you to help you choose the right size. 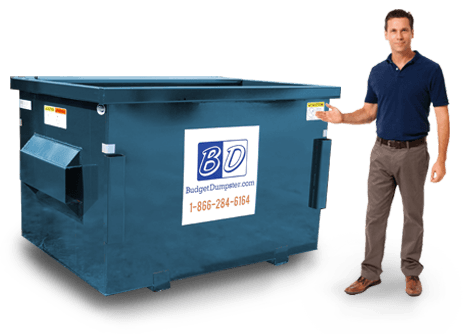 Each dumpster is available with a one year contract, but we know you'll want to stick around with us longer once that time is up. 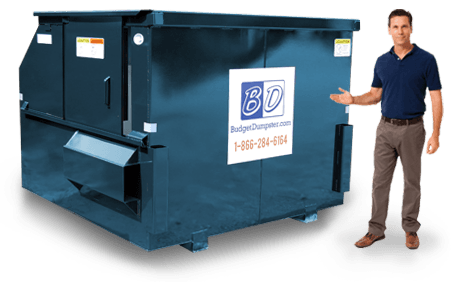 When you rent with us at Budget Dumpster, you're getting a two-for-one deal. That is, on top of getting the best dumpster service, you'll also be getting the best customer service in the industry. Our representatives are trained in the business, and know everything there is to know about dumpsters, inside and out. 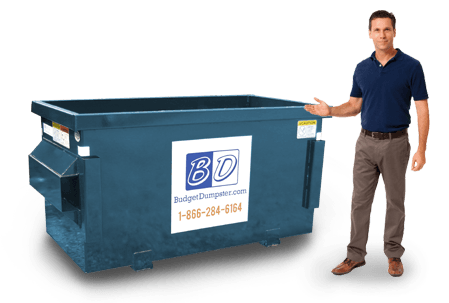 Customer service is one of our top priorities at Budget Dumpster, because we wouldn't be anywhere if it weren't for loyal customers like you. We're honest and upfront about everything in the contract so you know exactly what you're getting in to. We might be biased, but we think you're in for something pretty great. Give us a call today and see for yourself. If you're looking for just a little bit of weekly waste disposal, you've come to the right place. The 2 yard dumpster is the perfect size for small businesses or restaurants and offices that are less than 2,500 square feet in size. Its small size can fit anywhere on the premises and the short walls allow for easy loading. It is the most economical option for those who have a tight budget or for those who don't have a lot of debris to get rid of. The 2-yarder can hold up to 800 pounds of debris, which is about the same amount as a one ton pickup truck can carry. The 4 yard dumpster is a perfect option for those who want something bigger than our smallest option, but not something that's going to take up too much space. The 4-yarder will hold up to 1,000 pounds of debris, which is about the equivalent of 2 pickup trucks. There are a variety of placement options with the 6 foot by 4 foot dimensions, and it is easy to load up with the sides only reaching 4.5 feet high. Some common renters include small grocers, service stations, places of worship, small to medium sized offices, and various other small retailers. You can find 6 yard dumpsters just about anywhere, and that's because this is the most popular option. Consider it a universal dumpster, it will work with just about any business' needs. It will hold up to 1,400 pounds of waste, or about as much as three pickup trucks can carry. It is easily accessible with a sliding door on the side, so you won't have to ever lift up garbage bags above your head to toss them in. Renters that fall into this group include apartment buildings grocery stores, strip malls, large office buildings, and more. If you're looking for the biggest of all the commercial dumpsters, you've stumbled upon it here. 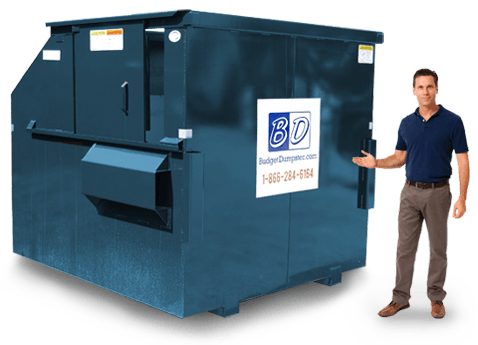 The 8-yarder is the largest size of commercial dumpsters offered by us at Budget Dumpster. Fill it up with 4 pickup trucks' worth of debris, because it can handle up to 1,600 pounds of trash. The dimensions are much larger on the inside, so it will be able to handle your bulky materials and heavy weekly trash flow. There is also a sliding door on the side to throw in your materials, because we're all about making things easier. Common renters of this size include large warehouses, distribution centers, apartment complexes, malls, and the largest of offices up to 25,000 square feet in size.